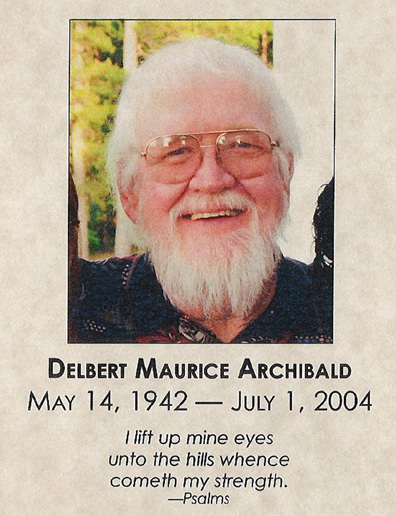 Delbert M. Archibald Delbert Maurice Archibald, 62, died Thursday, July 1, 2004, from cancer. He is survived by his wife of 27 years, Kathy Archibald. The graveside service will be at 11 a.m. EDT Monday at Sunnyhill Cemetery on Roberts Road. Family will receive friends from 4 to 7 p.m. EDT today at Culley's MeadowWood Funeral Home, Timberlane Road Chapel (850-893-4177). In lieu of flowers, memorial contributions may be made to Big Bend Hospice, 1723 Mahan Center Blvd., Tallahassee, FL 32308, Community Foundation of North Florida, 322 Beard St., Tallahassee, FL 32303. 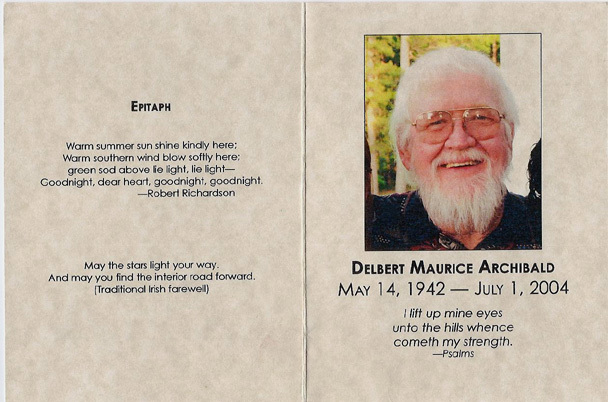 Del was born in New Albany, Ind., and had resided in Tallahassee for the past 36 years. Del was an entrepreneur and philanthropist. He founded the Printing House in 1972 in Tallahassee and grew the company to be the third-largest printing company in Florida. In 1989 he acquired Homes and Land, a national real-estate publishing company. He was known for pursuing innovative techniques and his companies were beta test sites for cutting-edge technology in printing and graphic design. Homes and Land was the first real-estate company to utilize the Internet to promote national listings. Del served on the Board of Directors of the Printing Industries of Florida and the Presidents Roundtable for the Printing Industries of America. He also served the graphic field as a consultant for innovation in production. He will always be remembered as a boss who treated his employees as members of his own family and as a man who could fix anything that was broken. He was a perfectionist in his business and personal life. Throughout his life he espoused the ideals of giving back to the community, both professionally and personally. Del was honored in 2002 by the Association of Fund-raising Professionals as the Outstanding Philanthropist of the Year and by the Children's Home Society in 1999 as its Outstanding Child Advocate of the Year. He and his wife, Kathy, established the Archibald Foundation in 1996 to provide generous charitable grants to the Big Bend community. He was a Florida State University "Micco" donor, giving liberally to athletic scholarships and was a member of the President's Club. He had been a Seminole booster for nearly 30 years. In his retirement he enjoyed the family farm and could often be seen tending the fields or chasing a little white ball down the fairways of the Killearn Country Club. He was a member of the SLUGS golfing group, where he made many lasting friendships. In addition he had been an avid sport fisherman all his life. Del enjoyed traveling the world with his family and friends, from shooting the rapids of the American West to shooting photos of wild game in Africa. 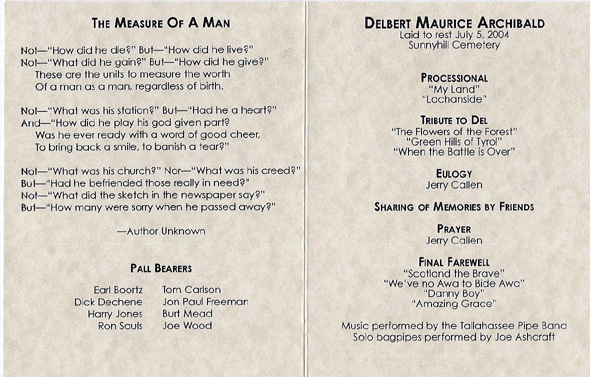 Del was the type of man who could be counted on as a great friend and placed family foremost in his life. He was a self-made man who believed in hard work, but always held out a helping hand to others. Del was principled in his ideals and lived a virtuous life, leading by example. He lived a life with no regrets and will be sorely missed by all who knew and loved him. He passed away at home, surrounded by his loving family. Other survivors include four sons, Delbert Maurice Archibald Jr. (and wife Judith) of New Albany, Robert Archibald of Austin, Texas, Daniel Archibald (and wife Laura) of Tallahassee and Kenneth Archibald of Savannah, Ga.; a stepdaughter, Yvonne Dowling (and husband Wendell) of Tallahassee; two sisters, Joyce Shelton of Havana, Ga., and Carole Jones (and husband Harry) of McDonough, Ga.; a brother, Elmer Archibald Jr. (and wife Betty) of Kernersville, N.C.; eight grandchildren; and a great-grandchild. He was preceded in death by his mother, Regina Archibald; his father, Elmer Archibald Sr.; and a brother, Elwood Archibald. Published in the Tallahassee Democrat from 7/3/2004 - 7/4/2004.